I’ve just posted my City of Rocks photos here. The rock formations there were simply fascinating, but sadly we didn’t find anything in the park that could explain the strange erosion patterns to us (was the erosion caused by water?) From Wikipedia today I learn that the rock formations in the area are granitic batholiths. 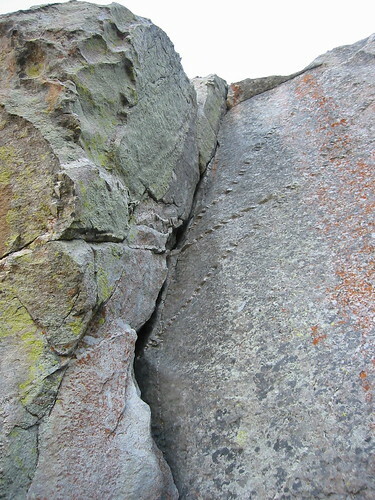 The strange pockets, as seen in the photo below on a route at Flaming Rock, are formed by a specific kind of erosion process called exfoliation. The edges of those pockets -thin, but still granite- were a lot more reassuring than our limestone jugs at Barn Bluff.